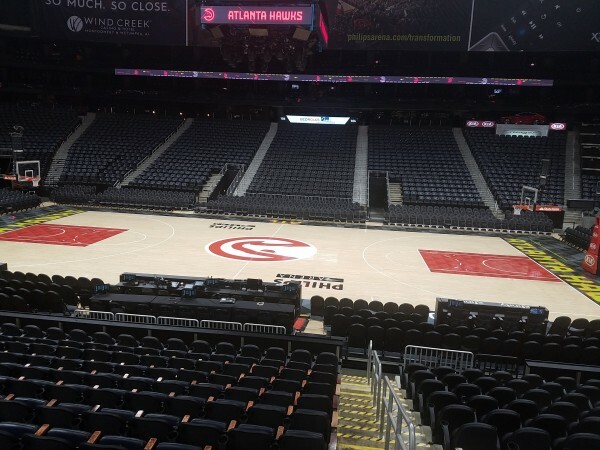 The Atlanta Hawks Enterprise along with the Philips Arena are working to change the way people experience basketball games and arena events. How you may ask? Through food of course! 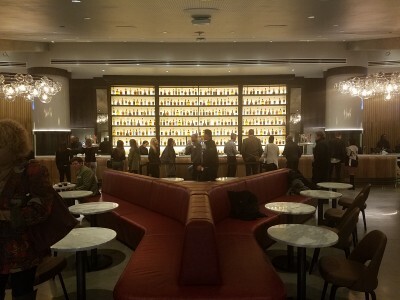 This past week the Atlanta food influencing community was invited out to experience what was to come. As always you know it was the Dynamic Duo in the house. To be honest, I was Rochelle’s plus one for this event and I was glad I attended. Welcome to the Courtside Club!! There is something about seeing the arena empty. Sort of like the calm before the storm. A group of us arrived early to the arena and walked in through the seats down towards the court. I took it all in as I knew the view I had would change as the other guests arrived. We were escorted to check-in to get the dreaded or sometime life saving name tag. Lines always lead to you running into those you know in the community. Hellos, hugs and much needed greetings. Knowing you’re amongst friends always seems to make events a lot easier and fun to handle. We were then lead to the entrance of the Courtside Club. The first thing that greets you is the sound of the DJ doing his thing followed by a view of what we learned was the Hawks’ Bar. Photo op! Thanks to Jalani for helping to capture that image for us. Actually he captured quite a few shots for us, including us in front of the step and repeat for the Hawks and Emory. We were greeted by 2 lovely ladies at the doorway to the Courtside Club. And behind them was one of the most impressive looking bars I’d seen in a while. It was one that cold draw even the non-alcohol drinker to order something. Once inside, it was also inevitable that you’d be drawn into the food stations. There was everything from a Charcuterie station, Pizza station with a pizza oven and all the trimmings, gourmet food including lamb chops, duck confit, salads and much more. And let’s not forget the dessert station. This was truly next level entertaining. There were large screen televisions throughout the club so you never miss a beat from your game or concert. I want to believe they thought of everything. Did I mention the bar?? Lamb…at the basketball game…yes at the Courtside Club. There is no way you can go wrong within the Courtside Club. Actually as told by the Hawks CEO, Steven Koonin, this is just one of three new clubs opening within the arena. We also had a chance to hear from the executive chef, Joseph Schafer, who I’ve heard was swiped from Bacchanalia, a local restaurant here in Atlanta. Chef Schafer spoke of how he intends to bring newness to the arena through food, along with his hand selected staff and menu creations. Philips Arena is becoming every foodies dream come true and I am all for it. Well since I’m spilling some beans, I’ll share that starting with the Bon Jovi concert in April, concert attendees will be able to purchase an upgrade to their ticket with access to Courtside Club. Can concert going get any better than this? Can it? I want to send a special thank you to Janet Smith and her staff for putting on such a memorable event. I look forward to seeing what they do next. The next time you plan to attend a game or a concert or even Disney on Ice, look into getting a chance to live it up in the Courtside Club. It will make for wonderful memories. I know I made some great ones there. Now go forward and make new memories.